Mesnel won 56 caps for France during a nine-year international career that included appearances at three Rugby World Cups. The Neuilly-sur-Seine-born fly-half and centre, trained as an architect before embracing rugby with first Saint-Germain-en-Laye and then, more famously, Racing Club de France in Paris - now know as Racing Metro 92. He made a swift ascent to the international stage, making his debut against the All Blacks in 1986, and a year later he played in the 29-9 defeat to New Zealand in the Rugby World Cup Final at Eden Park. The Auckland stadium would also provide the name for the clothing company he formed later the same year alongside fellow stars of Racing's 'Le Showbizz' era - Jean-Baptiste Lafond, Eric Blanc, Yvon Rousset and Philippe Guillard. Racing had suffered a narrow 15-12 defeat to Toulon in the 1987 French championship final - a game made famous by the fact that Mesnel and the rest of the team wore pink bow ties. Mesnel would eventually taste success in the battle for the Bouclier de Brennus with Racing's 22-12 victory over Agen in the 1990 final. 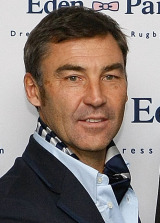 Mesnel scored eight tries for France including one during Les Bleus' Five Nations Championship Grand Slam season in 1987. He would later share in France's Championship successes in 1988, 1989 and 1993. Since hanging up his boots Mesnel has worked as a commentator and a co-owner of Racing, but having now sold his share in the Paris club, he is able to concentrate his efforts on the fortunes of the world-famous Eden Park brand.